The dry root and rhizome of perennial herbaceous plant Salvia miltiorrhiza Bge. of family labiatae. Sichuan, Anhui and Jiangsu provinces in China. Collected in spring and summer. Light smell, lightly bitter and astringent taste. Unprocessed or processed with wine. Bitter, lightly cold; heart and liver meridians entered. Activate blood and remove stasis, cool blood and remove abscess, relieve restlessness and induce tranquilization. This herb is good at activating blood and resolving stasis and unblocking meridians. It dispels stasis and promotes regeneration without damaging healthy qi. It is widely indicated for all kinds of diseases and .syndromes caused by blood stasis accumulation and obstruction. It is indicated for irregular menstruation, dysmenorrhea, amenorrhea and postpartum abdominal pain due to blood stasis accumulation and obstruction of women. This herb serves as the key gynecological herb for activating blood and regulating menstruation because it can activate blood and regulate menstruation, unblock blood vessels and dispel blood stasis. It is mostly suitable for gynecological diseases and syndromes caused by blood heat and stasis accumulation because it is cold and cool in nature that confers it the action of cooling blood. It is used alone, or with wine or combined with blood-activating and menstruation-regulating herbs such as Yi Mu Cao and Dang Gui, etc. It can activate blood and resolve stasis, alleviate pain and eliminate mass so it is indicated for pain of heart, chest, epigastrium and abdomen due to blood stasis and mass. 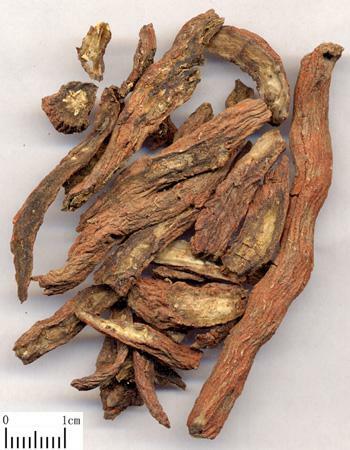 This herb is also indicated for wind-damp arthralgia, traumatic injuries, congestion, swelling and pain because it can unblock blood vessels, relax joints and resolve swelling and alleviate pain, For angina pectoris due to blood stasis accumulation in the blood vessels and pain of gastrium and abdomen, it is combined with qi-moving analgesics. For instance it is combined with Sha Ren and Tan Xiang in Dan Shen Yin from Yi Zong Jin Jian. For mass, it is combined with blood-breaking and qi-moving herbs and hardness-softening and nodulation-dissipating herbs such as San Leng, E Zhu arid Bie Jia, etc. For traumatic injuries and body pain caused by blood stasis, it is combined with blood-activating analgesics such as San Qi, Ru Xiang and Mo Yao, etc. For wind-damp arthralgia, it is combined with wind-damp dispelling herbs such as Du Huo, Fang Feng and Qin Jiao, etc. This herb can purge by its bitter flavor and clear heat by its lightly cold nature. It moves stagnant blood, cool heat in the blood, resolve swelling and abscess and alleviate pain. For carbuncles, swellings, sores and abscesses, swollen and painful acute mastitis, it is combined with heat-clearing and toxicity-relieving herbs such as Jin Yin Hua, Lian Qiao]] and Pu Gong Ying, etc. to enhance its actions of resolving abscesses and swellings. This herb clears heart fire, cools blood heat, calms down the mind and relieves restlessness and palpitation. So it is usually indicated for heat entering nutrient-blood, restlessness and insomnia of warm and heat disease, and palpitation, insomnia and fearful throbbing of miscellaneous diseases. For high fever, delirium, restlessness, poor sleep and scarlet tongue body of heat entering nutrient-blood of warm disease, it is usually combined with nutrient-blood-clearing and blood-cooling herbs. For instance it is combined with Sheng Di Huang, Xuan Shen and Zhu Ye in Qing Ying Tang from Wen Bing Tiao Bian. Decoct 5~15 g. Processed with wine is for activating blood and resolving stasis. Use with cautions for pregnant women. Contraindicated to Li Lu.